RP28900CB is rated 3.9 out of 5 by 8. Rated 5 out of 5 by tenner from Delivered fast, easy to install I bought this when the original began to leak at the valve, dripping down into the cabinet. It arrived on time and only took a few minutes to install with the quick connect. It's cosmetically a little different from the original one, but the finish matches, and it works fine. Rated 5 out of 5 by 1stclasmale from No Problems!!! I've owned this complete faucet model for the last 12 years and NEVER had a single issue with it since its been installed. Its been a worthy tool for my kitchen. Rated 5 out of 5 by triglidepop from Delta spray&hose Worked great stoped the leak. Rated 2 out of 5 by sevymt from not so great I did not like the hook up it to the pipe. I did not seem very secure. It looked like a leak waiting to happen. Rated 5 out of 5 by Anonymous from Replacement This product was a replacement part for an old leaky sprayer. The new one came with the hose and all. Easy replacement. Nicely packaged and prompt delivery. Rated 5 out of 5 by Dude1 from Awsome experience! I bought 2 other products along with this one that I am extremly pleased with. They were repair parts but saved a $200 sink fixture from having to be replaced. I first bought some parts that were wrong BY MY OWN FAULT. It was a piece of cake to return them and I was refunded almost immediatly. When I did figure out what I needed, I ordered online and had my parts within 5 days, all the parts were right on! It was also extremely easy to get a hold of a live person by calling. THANX FCTDRCT! Rated 1 out of 5 by efokim from drips I got rid of the old one because it dripped from the head, down the hose, and into the sink-hole, from whence it dripped onto the kitchen cabinet base thus allwoing water to collect. Since i prefer a dry base (rather than one that is moist, moldy and rotting0 I now leave this spray nozzle hanging into the sink and do not use it. At some point, I will attempt to Uuninstall" the below cabinet parts of the spray hose, and plug the sink-hole on top. Summary: Original spray hose leaks. replacement leaks. Rated 3 out of 5 by JonH from Good Visual Aid Couldn't buy a rebuild kit for the leaky part I had, so I had to get this expensive replacement instead. It didn't exactly match my old part, no installation instructions and a bag of adaptors to try to figure out (never did). However, it is a great visual aid - examined the head and compared it to the old leaky one. FOund out the old one had been incorrectly assembled at the factory 10 years ago. Swapped the o-ring and snap ring on the old one and now it works fine! Only problem is that I'm stuck with a $32 item I really didn't need. What type of connection is on the spray assembly #rp28900bs? Is it a quick connect? Thank you for your question. 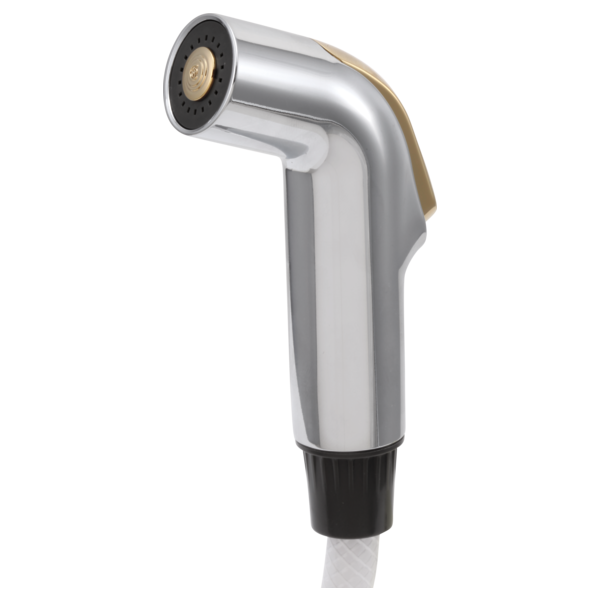 Delta Faucet model # RP28900BS is not a quick connect sprayer. This sprayer is used for faucet that were manufactured before September 2002.
can i order the part the part on the bottom of nozzle. I need the part that screws into the bottom of nozzle between the nozzle bottom and hose. What is this part called and part number. I do not know the exact model of my faucet, but it looks similar. how does the hose connect to the faucet assemblly? I just need to replace the spray nozzle, don't need the hose or hardware. Is it possible just to buy the spray nozzle only? If so what is the part number? (resubmitting after bounced email) I need to replace only the spray nozzle but all I found is RP28900SS. I don't need the hose and hardware though. Can I purchase just the spray nozzle alone? If so, what is the part number? I have a &quot;no name&quot; faucet with a brass screw on fitting for the side sprayer. The home was built in 2003. Good chance this will fit?